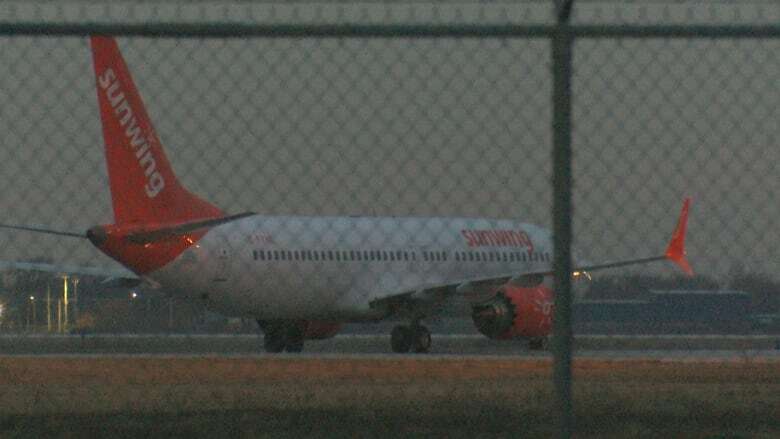 Three Boeing 737 Max 8 aircraft belonging to Sunwing Airlines departed from Toronto Pearson International Airport Wednesday evening, hours after Canada has banned them from the airspace. Three Boeing 737 Max 8 airplanes—all belonging to Sunwing Airlines—departed Toronto and landed at the Windsor International Airport Wednesday, hours after the plane model was banned from the airspace in Canada. The Boeing 737 Max 8 was involved in a fatal Ethiopian Airlines crash this past weekend, which killed all 157 people on board. Sunwing 9001, 9002 and 9003 left at 6 p.m., 6:30 p.m. and 7 p.m. All three flights arrived at YQG by 7:36 p.m., according to FlightAware. On Wednesday morning, Transport Minister Marc Garneau told reporters that Canada is grounding the aircraft and banning the jet from entering its airspace until further notice. "This safety notice restricts commercial passenger flights from any air operator, both domestic and foreign, of the Boeing 737 Max 8 and 9 aircraft from arriving, departing or overflying Canadian airspace," he said. A spokesperson for Sunwing Airlines told CBC News that Flight 9002 was not a commercial flight, but a ferry flight to position the aircraft in Windsor. "The safety notice issued by Transport Canada earlier today permitted the movement of Boeing 737 MAX 8 aircraft within Canadian airspace for repositioning," the email reads. In British Columbia, there was also a Westjet flight leaving Winnipeg and headed for Kelowna after the ban was issued, according to FlightAware. A Westjet spokesperson told CBC News the flight was being ferried for crew positioning, which "is allowed under the NOTAM (Notice to Airmen) issued by Transport Canada." According to Nav Canada, there was a national NOTAM file issued saying the aircraft are prohibited from or in Canadian airspace except "for ferry flights" or aircraft that are already in flight at the time of the notice. CBC News has reached out to Transport Canada for comment on policies around grounding airplanes.